Prominent & Leading Exporter from Ludhiana, we offer banknote sorter, banknote sorter & value counter and currency sorting machine. Accurate counting: quick accurate counting, error rate 1%. Classify note and worn note: adjust and classify note and worn note as 10 grades. Distinguish fake note and note being out of shape, automatically scan and distinguish two sides of note, accuracy 100%. Distinguish check and other kind of note: as the machine distinguishes and scans on two sides of note, may 100% distinguish check and other kind of note mixed. Distinguish front and back, left and right of note: according to user’s demand can distinguish front and back, left and right of note. Distinguish note with adhesive plaster: distinguish and collate note with adhesive plaster or worn and soiled note. 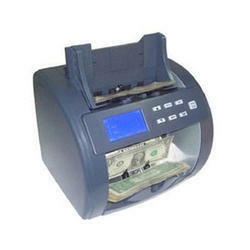 Alarm when finding fake note: when fake note passes, the machine will alarm, convenient to distinguish. Self-checking function: as the machine has self-checking function, when the machine finds that tableau proof has problem, or note is crushed or blocked, may display on monitor. Volume small: as design, realize small volume of machine. FIT : Fitness detection of soiling notes, de-inked notes, notes with adhesive plaster, holes tears, missing parts, and dog –ears. Effectively sort notes for the ATM. SORT : Currencies of different quality can be sorted according to 10 grades. ORIENT: Currencies can be oriented face up and down , portrait up and down. DENOMINATION : Currencies with different denomination can be easily sorted into the stackers as required. COUNT: Quick and accurate counting, error rate is less than 1%. AUTHENTICITY DETECTING : Distinguish fake notes and notes being out of shape, distinguish note, check and other kind of note. Environment condition: Temperature: 0-50; relative humidity 20-90%. 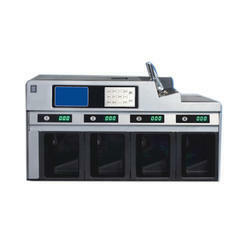 This banknote value counter uses High-Speed Image Process, Model Distinguish Technology, Mulch-Spectrum Paper Analyze and various Anti-Fake Technology to count and sort banknote by high precision and speed so that customers can operate with enormous efficiency procedure. High Precision Security by Four Anti-Fake Technology. Serial Number Function for Computer Memory or Bill Printing. Solution for Bank Branches, ATM, Supermarket, Retail stores etc..
Other local currencies can be adapted according to clients' request. Mixed Counting/Sorting Speed: 1000 notes/minute. 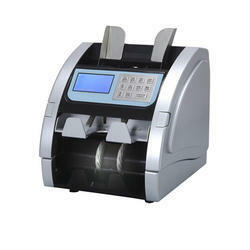 Serial Number Printing Speed: 400 notes/minute(optional). Reject Pocket Capacity: 100 notes. Power Supply: 220V+/-10% 50Hz; 110V+/-10% 60Hz. Dimensions: Wide 350X Deep 330X High 360(mm). Looking for Currency Sorting Machine ?